RMG International Distributors (Pty) Ltd trading as ENERGY 1 is an alternative energy company with its headquarters in Randburg, South Africa. 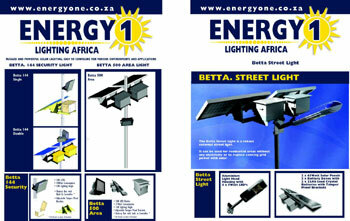 Specialising in solar lighting, Energy1 is the distributor for the Betta Lights range of products in Africa. Solar Lighting can effectively replace grid-powered lighting and can be a great solution for low cost and informal housing. recreational, emergency and standby lighting requirements. fluctuations amongst others. Our supply factories are ISO-9000 certified. These products make use of revolutionary Lead Crystal Battery technology and are tried and tested in numerous applications in South Africa and Africa. 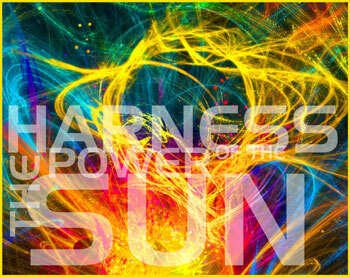 The batteries have excellent long lasting capacity and the lights have exceptional light brightness. Internal lighting solutions come standard with a cellphone charger. Energy1 is continually looking to introduce innovative alternate energy products into Africa, by way of its established support structures and experienced logistics team. Future direction of the Company will include practical and inexpensive methods in the provision of potable water to the rural areas of South Africa and Africa. 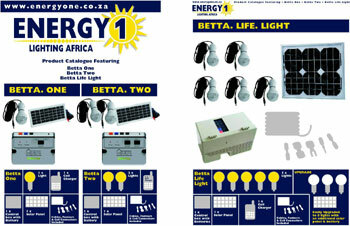 The products are designed for the African environment. Please contact us for further detailed information and pricing structures.